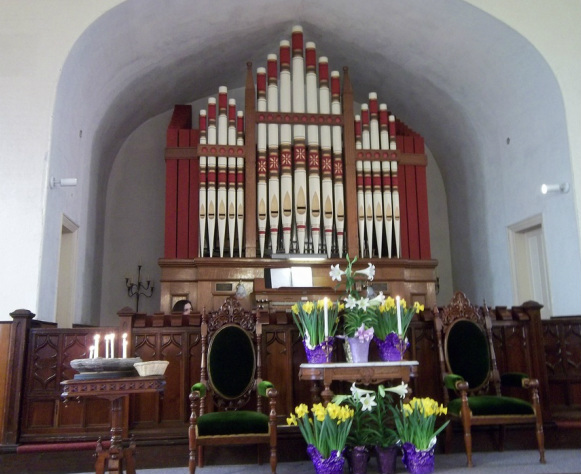 We at First Universalist Parish of Derby Line, VT would like to tell you little about our church. Although the church is named First Universalist Parish, we are actually called Unitarian Universalists. The two religions merged in 1961. Many Universalists are Christians, who believe in universal salvation. They don't believe that a loving God could punish anyone to hell for eternity. Instead, they believe that everyone will be reconciled with God eventually. While Universalist beliefs have been proclaimed for thousands of years, the faith didn't have the opportunity to form into a widespread religious movement until English Universalists came to America, in the late 1700's, to escape religious persecution. Universalism quickly became popular throughout the United States, especially in rural areas and the expanding western states. The Universalist denomination, called the Universalist Church of America, was formed by 1793. Universalists were best known for supporting education and non-sectarian schools, but they also worked on social issues including the separation of church and state, prison reform, capital punishment, the abolition of slavery, and women's rights. In 1873, the Universalists became the first group in the United States to ordain a woman with full denominational authority. Unitarians also called themselves Christians who didn't believe in the Holy Trinity of God (Father, Son, and the Holy Ghost). Instead, they believed in the unity or single aspect of God. Unitarianism eventually began to stress the importance of rational thinking, each person's direct relationship with God, and the humanity of Jesus. While Unitarian beliefs have been around since soon after Jesus died, people didn't form religious groups based on the ideas until the middle of the 1500's in Transylvania and the middle of the 1600's in England. The religious authorities of the times saw these Unitarians as heretics and they were often persecuted. Unitarianism flourished in the religious freedom of early America. By 1825, Unitarian ministers had formed a Unitarian denomination called the American Unitarian Association. Speaking out on issues such as peace, education reform, prison reform, orphanages, capital punishment, moderation in temperance, ministry to the poor, and the abolition of slavery. Their liberal voice was soon heard throughout the country. After growing closer theologically and ethically, the Unitarian and Universalist denominations consolidated in 1961 to form the Unitarian Universalist Association. The new religion no longer holds solely traditional Unitarian or Universalist beliefs, but does draw directly on its heritage for much of its inspiration and spirituality. The principles succinctly sum up who we are and what we stand for. We welcome all religions in our midst; You will find former Catholics, Jews, agnostics, atheists, humanists, pagans, and Buddhists in our congregations. This is the church of Thomas Jefferson, John Quincy Adams, Louisa May Alcott, Charles Dickens, Ralph Waldo Emerson, Paul Revere, Paul Newman, Pete Seeger, Kurt Vonnegut, and May Sarton. If you're looking for a sense of community that embraces diversity, spirituality, and some lively discussions, this is the church for you. Services at First Universalist Parish of Derby Line are held at 10:00 AM each Sunday. Religious education is available for children of all ages. If you would like more information about us, please call 802-873-3563.